This Christmas, the body shop 2018 beauty advent calendars have gone even further, far into an Enchanted Forest, filled with a clan of extraordinary creatures. Olivia the Owl guides you through 24 surprises to revive and re-energise your body and mind. Every day she’ll reveal one of a myriad of treats and must-haves, from bath and body favourites to superstar skincare surprises. Want to make this Christmas your most magical yet? Spoiler alert! Continue reading only if you want to find out all 24 amazing treats that await. 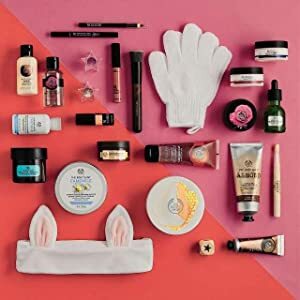 Body Shop Advent Calendar 2017 features classics, such as some of my favorite picks from the fresh and floral British Rose range, Vitamin E moisturizers, and the iconic Drops of Youth facial serum, as well as new products from the indulgent Spa of the World and Expert Facial Masks collection, The Body Shop Ultimate Advent Calendar is the perfect gift for her. Body Shop Advent Calendar 2017 Beautiful and packed with nature’s finest ingredients, this gift set is brimming with skincare, makeup and bath and body treats that will delight her each day, and keep her skin soft, smooth and sensationally scented all season long. You can either buy it as a gift or treat your self because why not? -British Rose Shower Gel 60ml. -Camomile Gentle Eye Makeup Remover 60ml. -Two Sided Star Stamp Black Eyeliner. -Nairobi Camellia Matte Liquid Lip 8ml. -Vitamin E Day Moisture Cream 50ml. -Vitamin E Night Moisture Cream 50ml. -Drops of Youth Concentrate 30ml. -British Rose Body Scrub 50ml. Thanks for sharing this I am trying to find out some best offer to buy body shop.